75 Day Sketch Challenge: Completed! I did it! I finished the 75 Day Sketch Challenge. 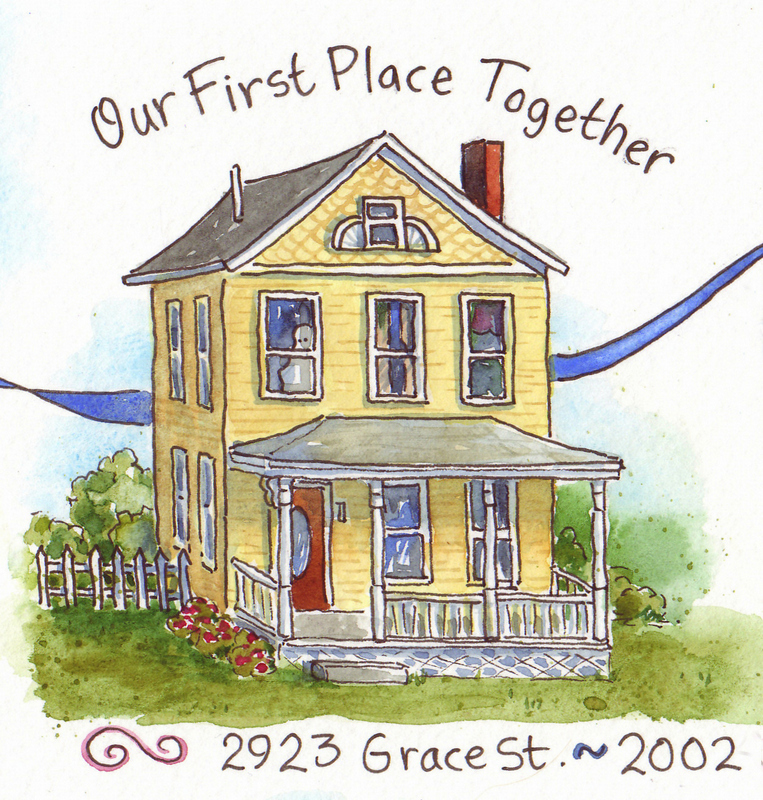 I am now an official National Artist with my very own Artistic License! 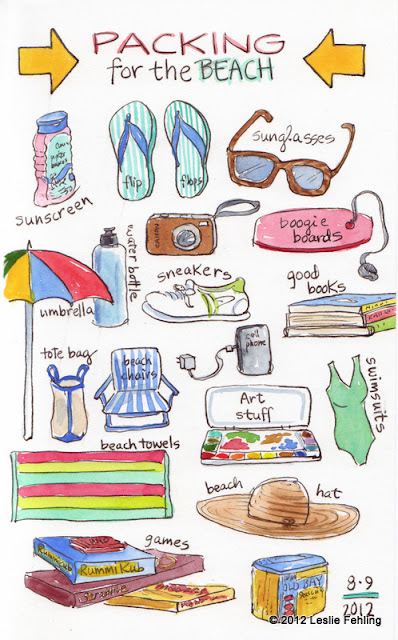 Okay, it may be a little silly, but it sure got me drawing last summer! 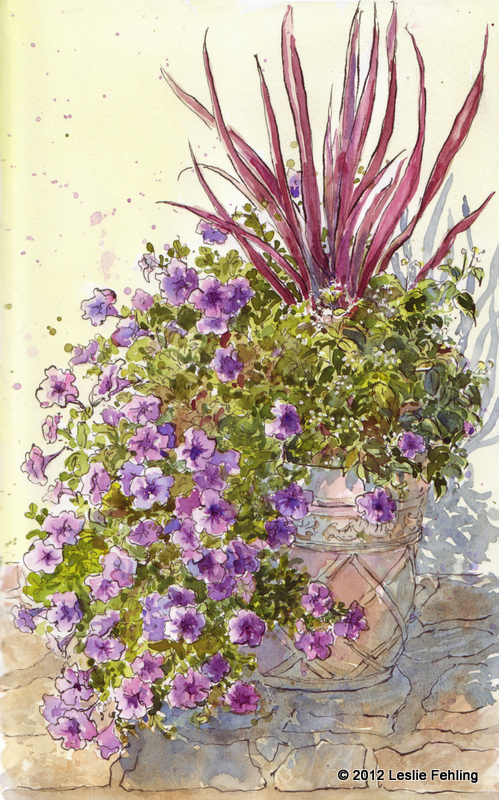 Many thanks go out to Brenda Swenson for offering the challenge and encouraging people to dive into drawing in a big way. The "Artistic License" that she awards to everyone who completes the seventy-five day challenge is just a fun way to motivate people to draw. I started the challenge on June 8 and did my final sketch (shown above) on August 22, 2012. 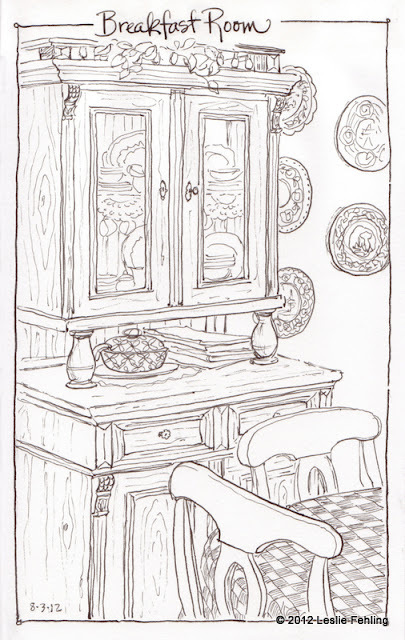 Every day I drew directly in ink in my sketchbook (as stipulated in the challenge rules) - no pencils or erasers were allowed. 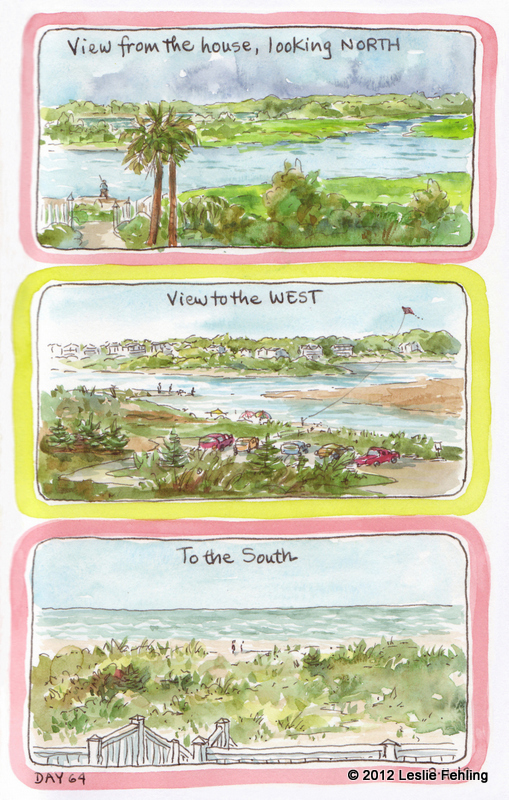 I also added watercolor to most of the sketches. I learned to observe my subject carefully before putting pen to paper. It taught me to pay close attention to the relationships between objects, observing how one thing relates to another in size, angle, and placement in space. I was inspired to create new page layouts, since I was using the same 5-1/2" x 8-1/2" sketchbook for the entire challenge, and I wanted to introduce some variety into my compositions. I tried out new lettering styles. I learned that there are no excuses for not drawing. 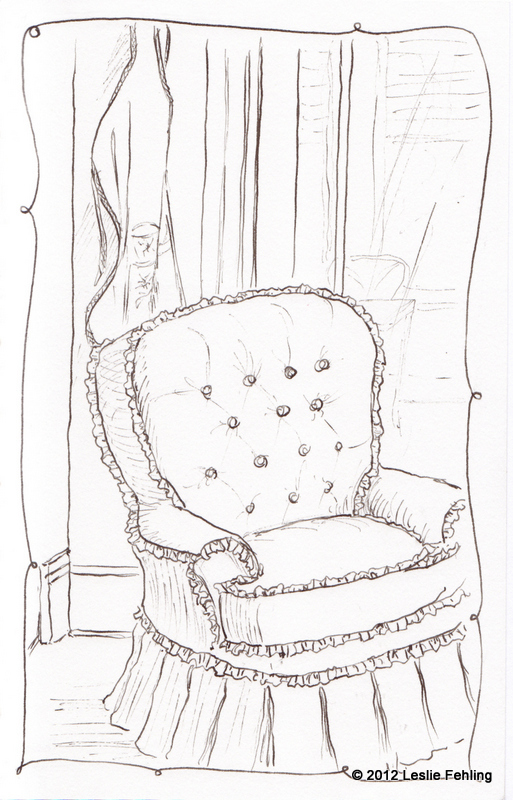 It's not easy to be consistent and sketch every day, but it is possible. It just takes determination and commitment, and a few minutes out of every twenty-four hours. 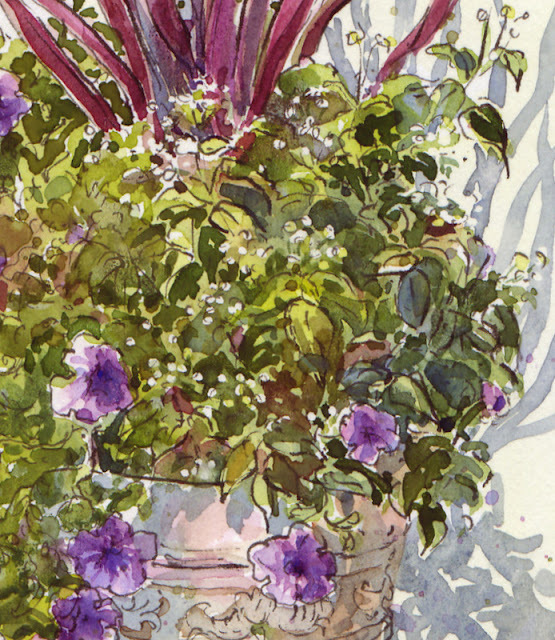 I conquered my fear of tackling things that are "hard to draw," like hydrangeas! 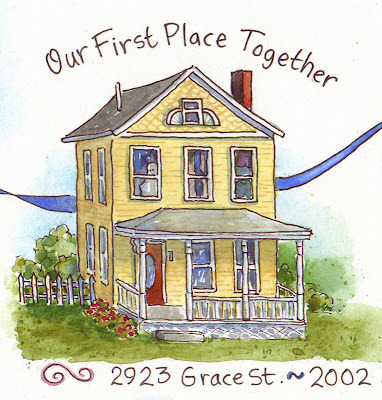 It inspired me to pass on my love of sketching by teaching two sketchbook journaling classes. It gave me an excuse to spend long hours drawing and painting. I still struggle with my tendency to want to make every sketch a perfect little gem, but I've realized over the past few months that drawing something - anything - no matter how imperfect, crooked, lopsided, or misproportioned that drawing might be, is always better than drawing nothing at all. I've filled one and a half Stillman and Birn Alpha Series sketchbooks with my challenge sketches, and I plan to continue to sketch directly in ink to finish filling the second one. I like the idea of finishing it in the same manner that I started. I hope the stories of my struggles and triumphs over the past few months of sketching will encourage you to try a 75 Day Sketch Challenge of your own one day. It was a creative boost for me, worth every minute I put into it. 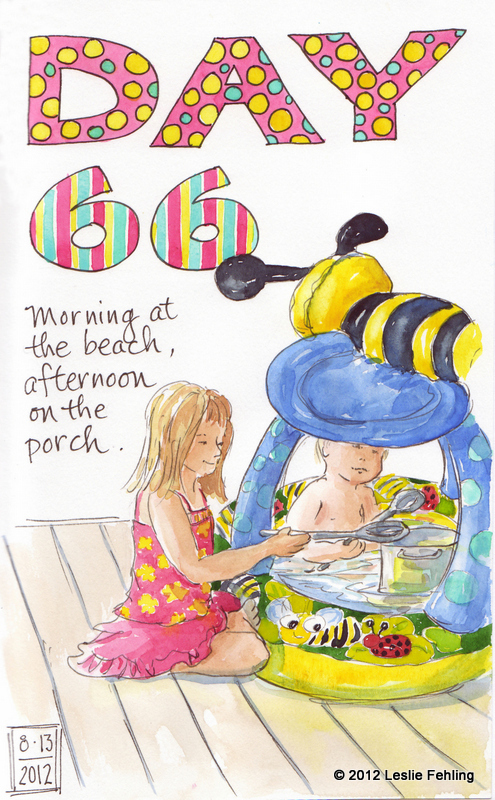 If you would like to see all seventy-five of the challenge sketches, stop by my online gallery and check out the "75 Day Sketch Challenge" album. At last! The final two days of my 75 Day Sketch challenge! I thought it would be a good idea to draw some of the summer flowers on our patio before the first frost nips them. These "Wave" petunias are my favorite. They've flourished throughout the summer, and are still thriving, despite the cooler fall temperatures we've had lately. 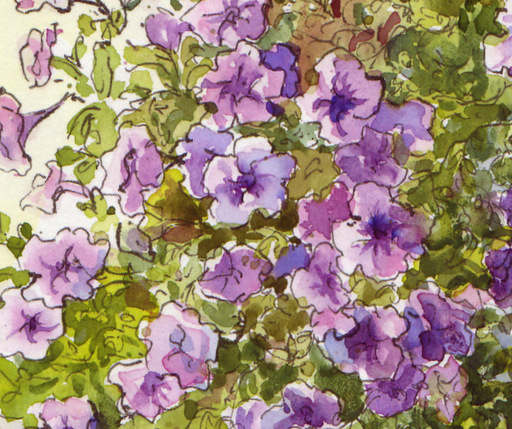 That mass of foliage and blooms was a lot to tackle with pen and ink. 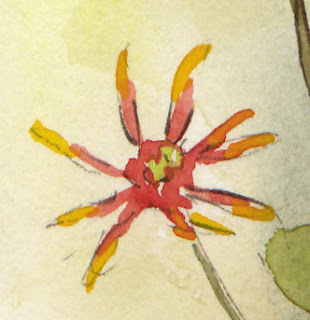 If I had been painting directly in watercolor, I would have simplified things a lot, but since this was a drawing exercise, I included a substantial amount of detail. Dabbing on touches of masking fluid helped to preserve the tiny blossoms of the white lantana while I painted the green background leaves. And now for the final sketch! Sketch #75 shows a view that I enjoy every day. 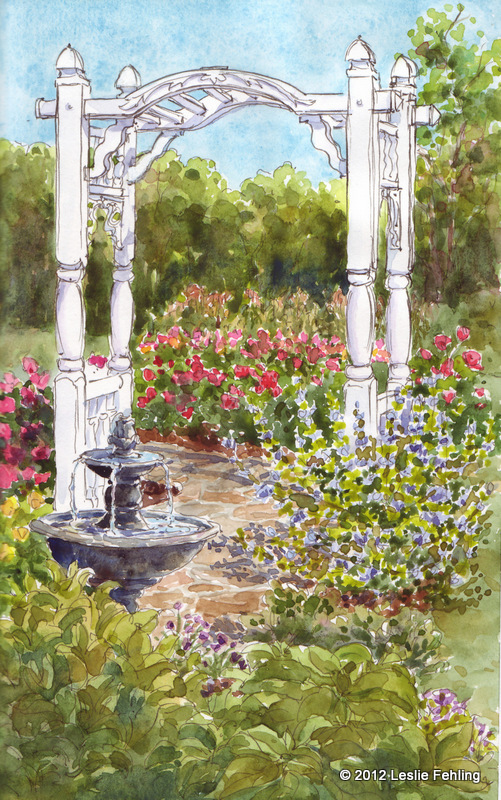 It's the arbor that my daughter was married under and the flagstone path leading from the stone patio just off the kitchen to the backyard and garden. It's particularly pretty in early summer, when masses of daisies, roses, clematis, and hydrangea compete for attention. But this fall the stars have been the hedge roses and the "Sunshine Blue" golden bluebeard. My garden path looks like something out of a fairy tale. 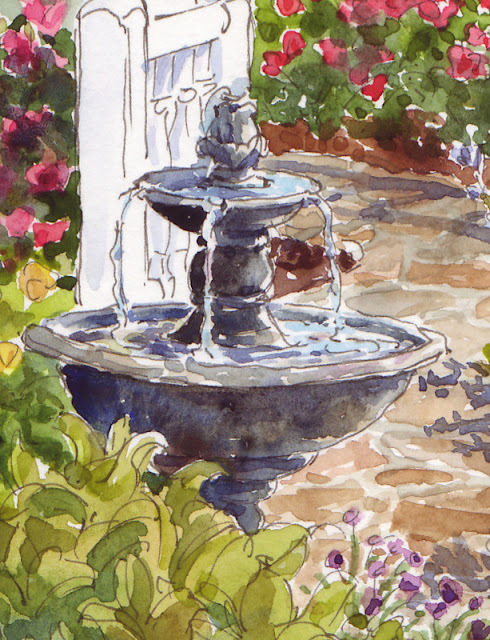 For years I longed to have a cottage garden filled with roses, an arbor, and a bubbling fountain. After several seasons of planting, mulching, weeding, pruning, and watering, I finally have it. All the effort was worthwhile. I feel the same way about the completed sketch challenge. Tomorrow I'll share a few thoughts about why I think the time invested was worthwhile. To see all of the seventy-five sketches that I completed for the 75 Day Sketch Challenge, visit my online art gallery, here. Ever since I left home to go away to college, I've relied on my grandmother's gingerbread recipe when I had a hankering for something spicy, warm, comforting, and yummy. 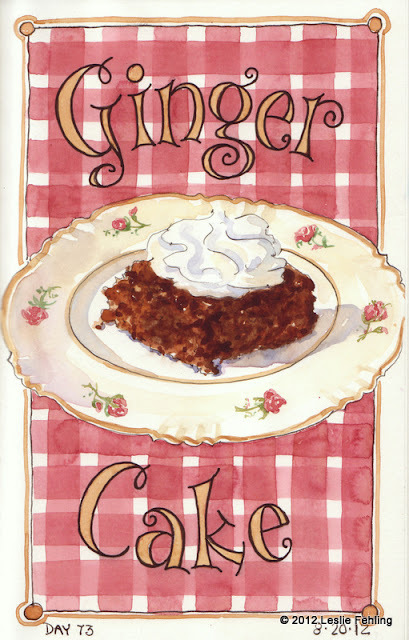 Imagine my surprise when I gave a new ginger cake recipe a try and found I liked it even better than our old family favorite! 2. Combine first 3 ingredients in a large mixing bowl; beat with a mixer at medium speed until well blended (about 1 minute). 3. Add eggs, 1 at a time, beating well after each addition. Stir in molasses. 4. Combine flour and next 7 ingredients (through salt) in a large bowl. Add flour mixture and 1 cup hot water alternately to sugar mixture, beginning and ending with flour. 5. Spoon batter into a 9” x 13” baking pan coated with cooking spray. Bake 30 minutes or until a wooden toothpick inserted in center comes out clean. Cool in pan. 6. Top pieces of cake with sweetened whipped cream, if desired. - To make this recipe gluten free, I replaced the regular wheat flour with Jules Gluten Free Flour. For the 1//2 cup of wheat germ, I substituted 1/4 cup of flaxseed meal + 1/4 cup Jules GF flour. - The spice amounts are flexible in this recipe. I used 1 tsp. cinnamon, 1/2 tsp. cloves, and 1 tsp. ginger. - This recipe was originally published in Cooking Light magazine in 2007. In a town north of Chicago lives a young woman who knows just how much her husband loves her. 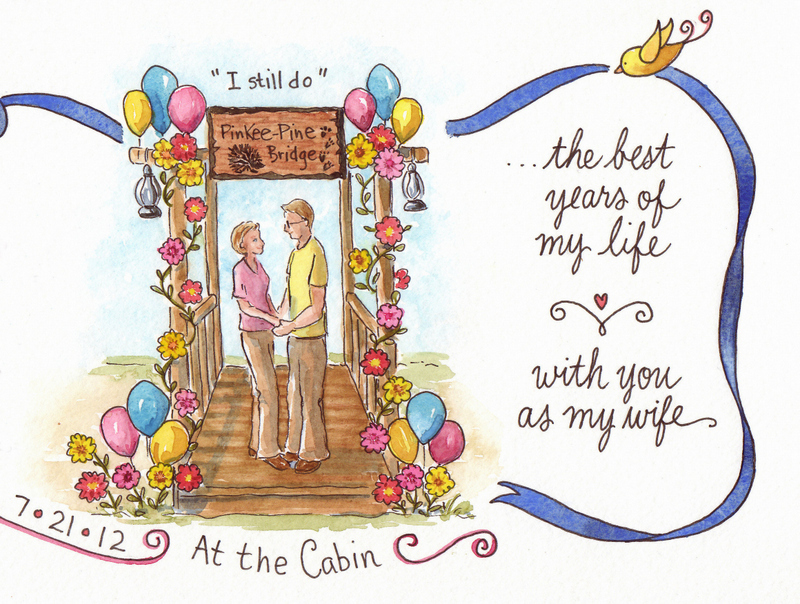 Mike spent months secretly planning a surprise tenth anniversary celebration for his wife, Peggy. 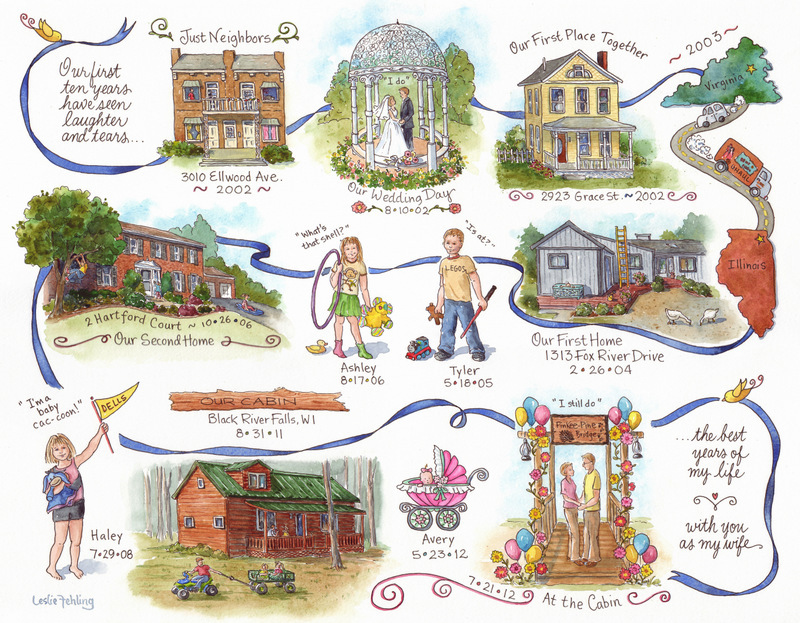 He contacted me last winter about doing a special commissioned watercolor timeline painting that would illustrate the highlights of their ten years together. Emails flew back and forth, as we planned the content of the painting, down to the tiniest detail. 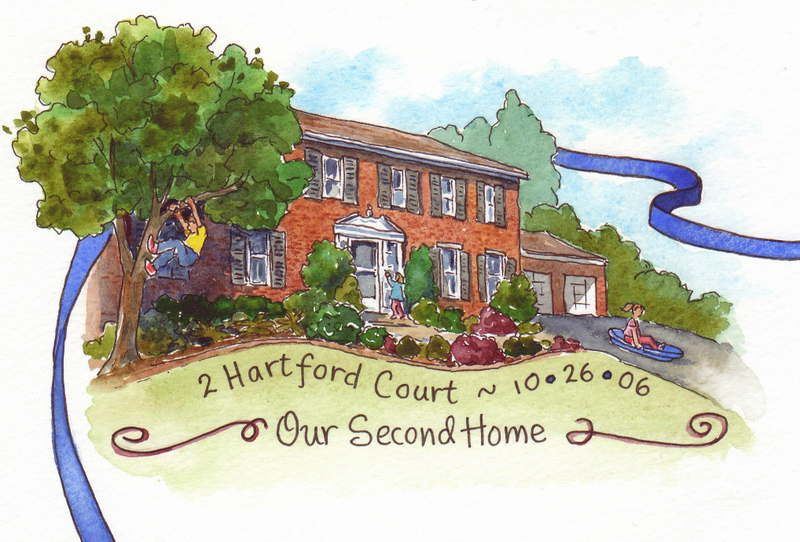 The resulting painting holds ten years worth of memories - reminders of courtship, marriage, homes, and children. Notice the ghost in the second floor window? The paint bucket, brush, and ladder are reminders of the time-consuming house renovation Mike and his wife undertook. See the baby peeping over the edge of the Pack-n-Play? 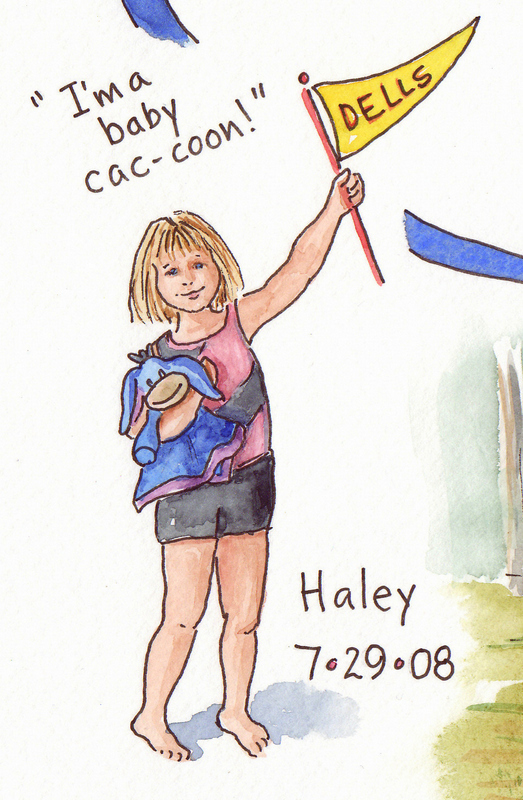 There were lots of specifics I needed to include on the kids' drawings. They are each pictured wearing their favorite T-shirts, and holding some of their favorite toys. Ashley has two different colored socks on. 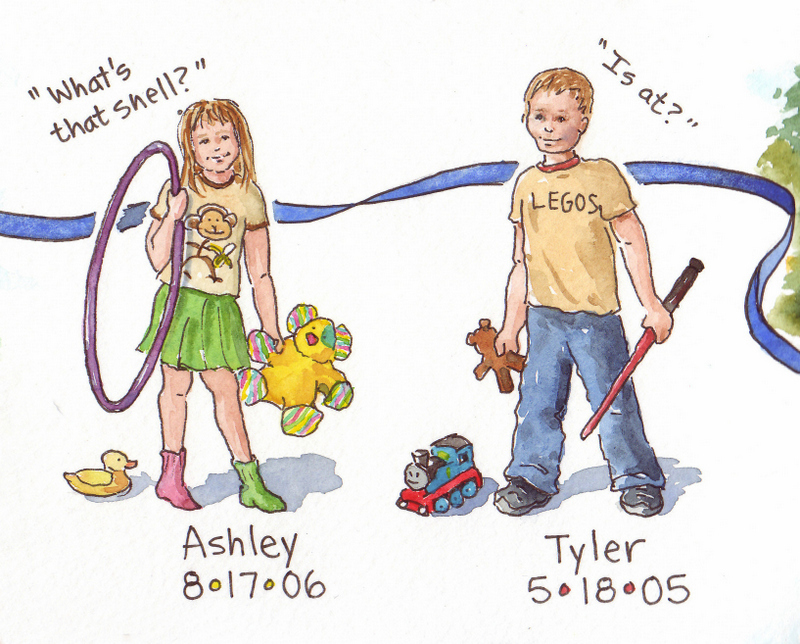 Funny childhood phrases accompany each child's portrait. 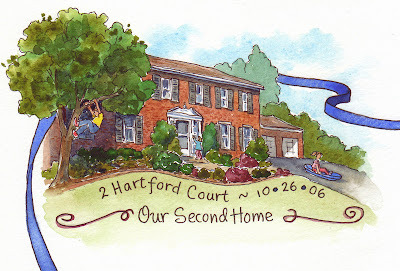 Next came a move to a bigger house, and another daughter, Haley, arrived in 2008. In this sketch, Tyler climbs a tree, Haley rings the doorbell, and Ashley takes a sled ride down the driveway - in the middle of summer! I had finished the entire painting by the beginning of May, except for one small but important detail. 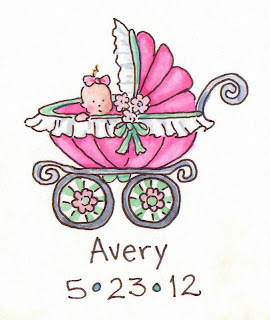 We were awaiting the arrival of little baby Avery, who finally entered the world on May 23rd. 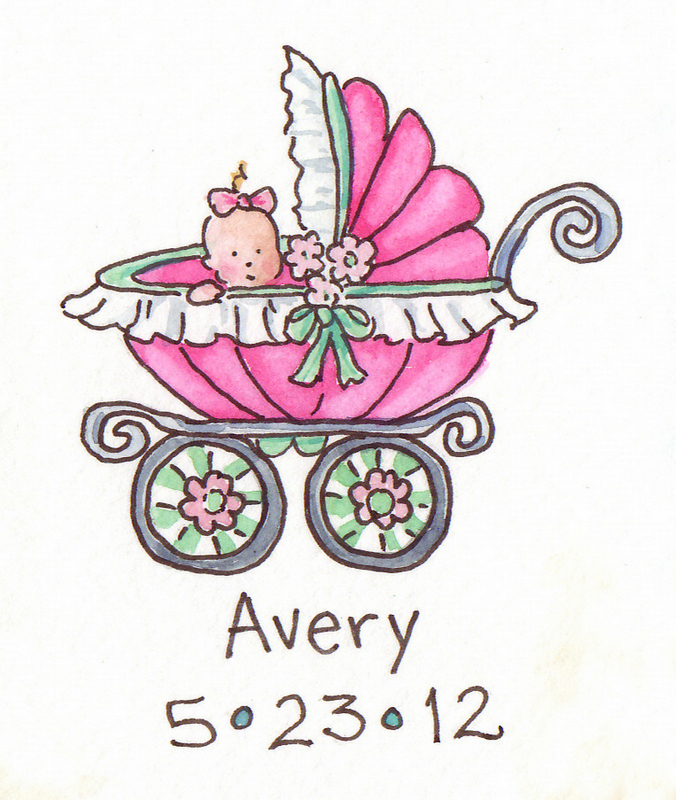 I filled in her birth date just before shipping the finished painting. Mike had built a small bridge over a stream on their property in the Wisconsin woods. For the anniversary celebration, he decorated it with gerbera daisies and colorful balloons, matching exactly what I had drawn in the sketch. The stage was set! 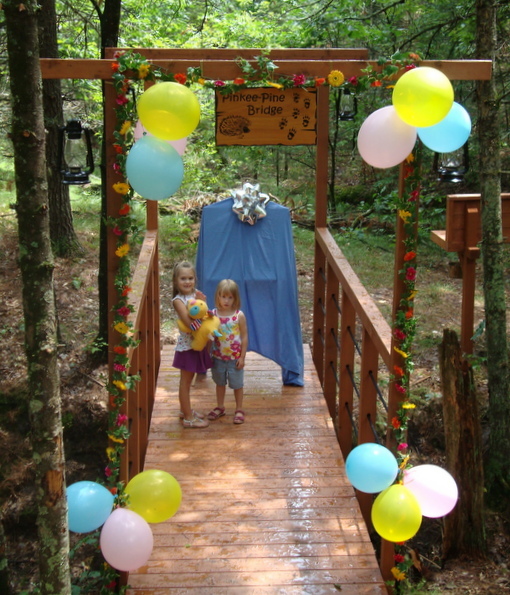 "The surprise was perfect! 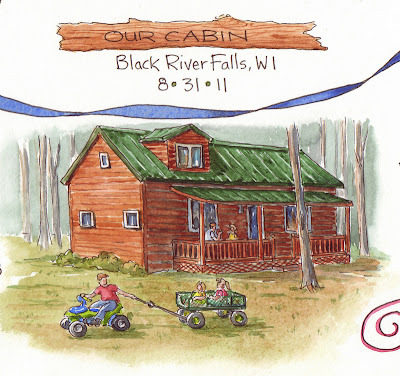 We arrived at the cabin and she was surprised by my parents being there (they drove from Virginia) - she was confused as to why they would drive all of the way out to the Western side of Wisconsin. Then I took her around to the back of the cabin where a huge banner, flowers, ivy, and a duplication of our wedding cake was waiting...she was very surprised. Then I took her down to the bridge where we renewed our vows. Her gift was waiting at the other end of the bridge on an easel." "She pulled off the sheet and spent a long time examining every detail of the painting. She loved it, and there were a few tears. Everyone enjoyed looking at the painting and learning the stories behind the small details of the painting. 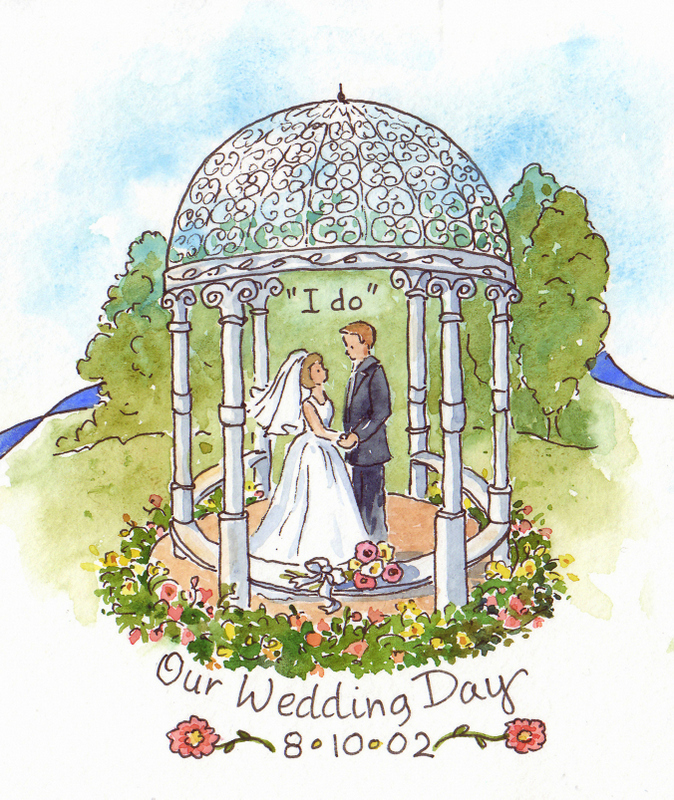 Thank you for your involvement and for helping to make this a great anniversary for both of us!" I just wish I could have been there for the unveiling! I can't imagine a more thoughtful and loving gift. 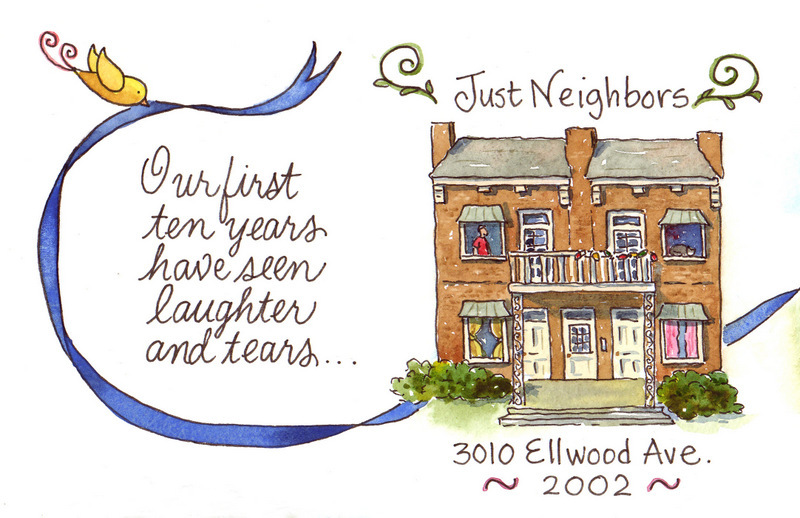 With all the heart Mike put into this tenth anniversary, it's going to be a hard act to follow. He'd better start planning now for their twentieth! If you are interested in commissioning a custom painting, and would like it in time for the holidays, please contact me soon. 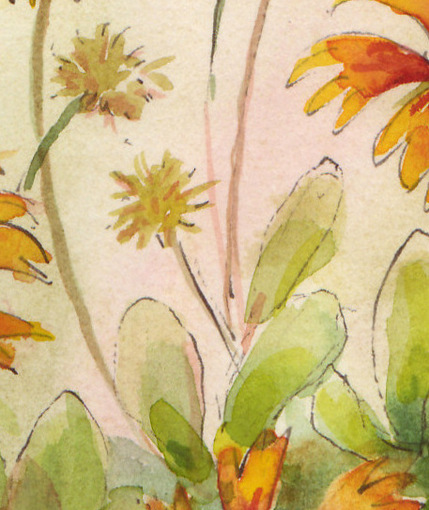 I'd love to design something special for you, but my schedule is filling up quickly, and I can only take a limited number of additional orders. I hope to hear from you! 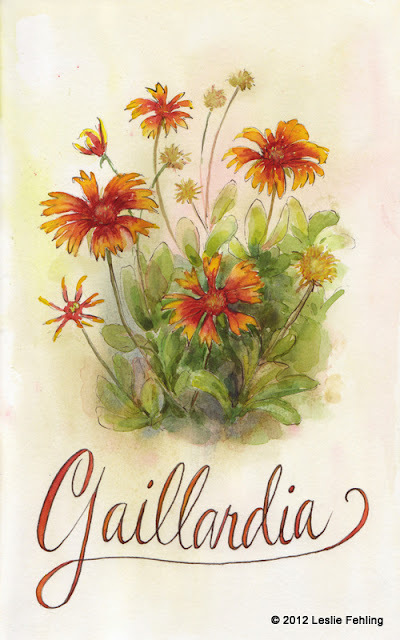 Several times a day, I took the meandering path from our house, through the dunes, to the beach, and each time I admired the colorful red and yellow blooms of the sturdy gaillardia growing in the hot, dry sand. 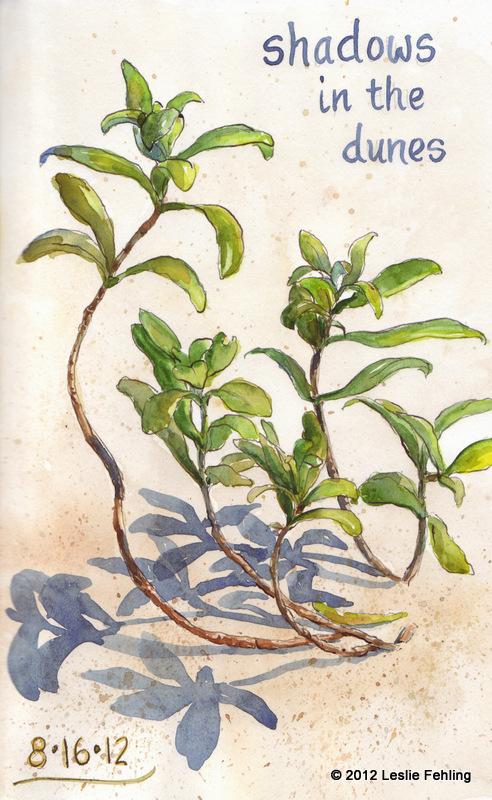 Finally, with our vacation drawing to a close, I stopped on my way home for lunch one day, unfolded my beach chair, and sat down to sketch one of the bushy little plants. 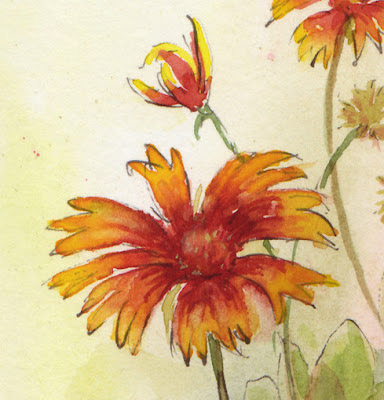 Gaillardia, related to the sunflower, is also known as "Blanket Flower"
The sun was beating down, so I drew quickly, putting the main blooms in place, then began to sketch the leaves. Just then, I realized that something was crawling up my bare legs ... actually, more like twenty "somethings"! There were ants heading for my knees, and more of them trailing up and into my tote bag. I furiously began brushing them off, while trying not to drop my sketchbook and fountain pen in the sand. Resolutely, I pulled my feet up onto the chair and added a few more leaves to the drawing, pausing frequently to brush away more ants who had determinedly scaled the chair legs. Finally, I gave up, packed up, and scurried down the path, leaving the gaillardia to their six-legged friends. Suddenly, it was Friday - time to pack up the boogie boards and sand buckets and prepare for the 11-hour drive home the next day. That bittersweet last evening at the beach came all too soon. I'm never ready for my beach week to end. 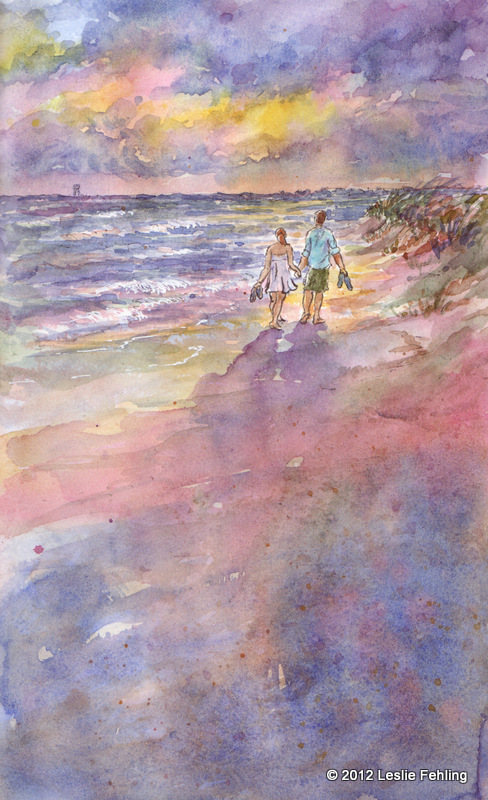 As we took one last sunset walk, I snapped a photo of my daughter and her husband strolling along, hand in hand, with the colorful sky reflected in the waves and on the glistening wet sand. 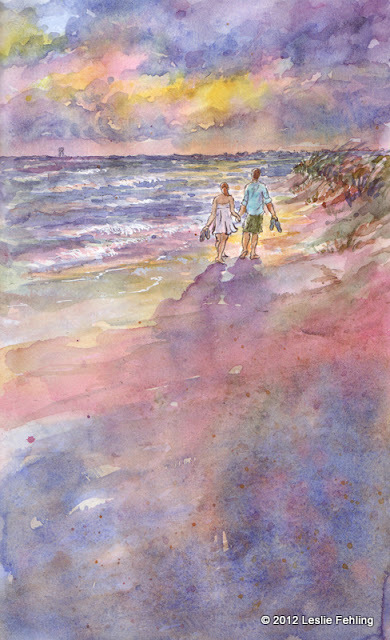 I painted the sketch later at home, and every time I look at, I feel a measure of the same peace and contentment that seven days of sand, water, wind, and waves bring to me. From my bedroom on the second floor of our rental house, I had a great view of the beach on the northern side of the island. Families and fishermen seemed to love the calmer waters of the river there, and provided me with endless drawing possibilities as they swam, floated, walked, ran, sat, and paddled all day long. So, taking a break from the hot midday sun, I contentedly sat and sketched one tiny figure after another until the page was full. These spindly plants caught my eye one day as I walked through the dunes, heading back to the house for lunch after a morning on the beach. The striking shadows looked almost black against the sand. 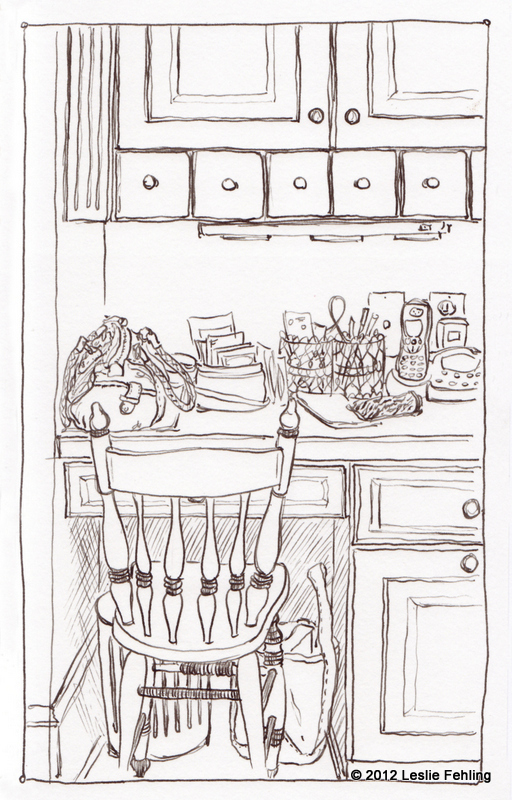 Even though I was starving, I stopped to do a quick line drawing. 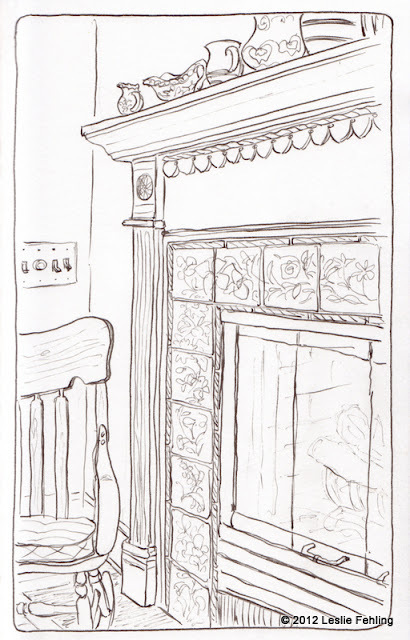 I didn't have a chance to paint it until much later, when we were back home in Pennsylvania. I enjoy working on vacation sketches after the fact. 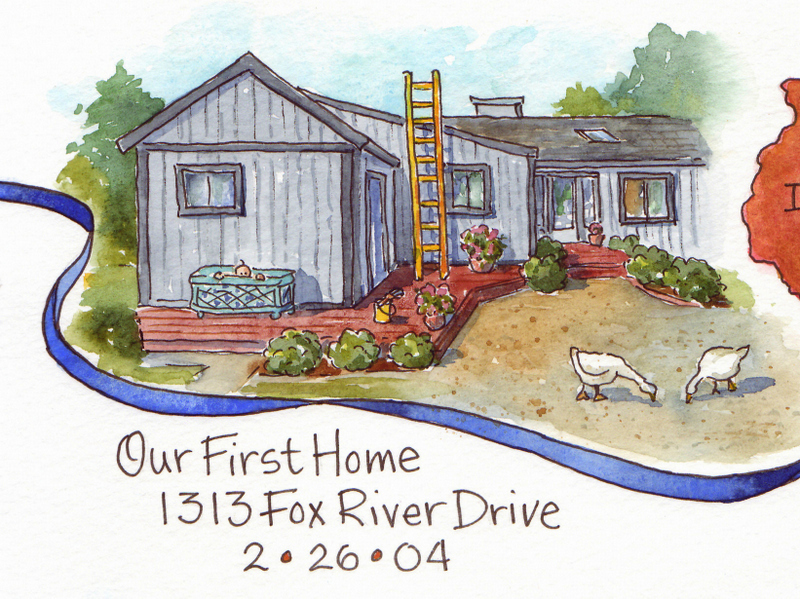 Looking at the photos and adding watercolor to the drawing takes me back. I can almost smell the salty air and feel the hot sand underfoot. I woke up really early one morning, in time to see the dark sky slowly brighten in the east as the sun peeped over the horizon and began its slow climb. The house was quiet as I slipped out onto the deck, down the steps, and through the dunes to the beach. 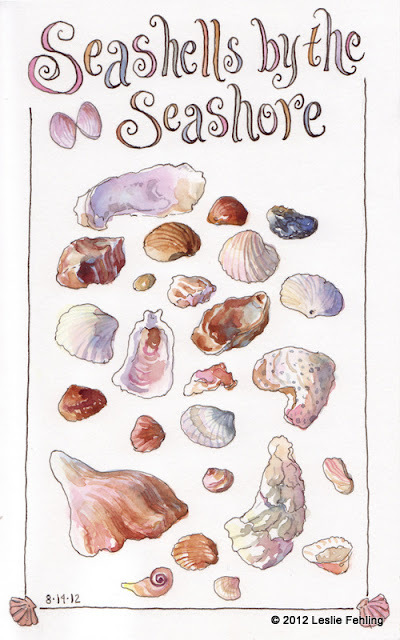 I walked for awhile, letting the waves wash over my bare feet, and picked up a few shells that caught my eye. I sat down facing the ocean, with the dunes at my back, and tossed the shells onto the sand in front of me. Taking my sketchbook and a pen from my bag, I carefully drew each shell. Tracing the contours with my pen, focusing on the swirls and ridges of each piece, I was in my own little world, with the sound of the sea my constant companion. The next day, on a rare trip to town, I stopped to draw this marsh scene (below.) There's a wooden walkway that crosses the water, and I walked about halfway across to find this view. I was so nervous about dropping my precious sketchbook in the water, though, that I quickly did just the barest hint of a sketch, then dashed off to the safety of dry land. The ink lines are so light and tentative that they're barely visible. 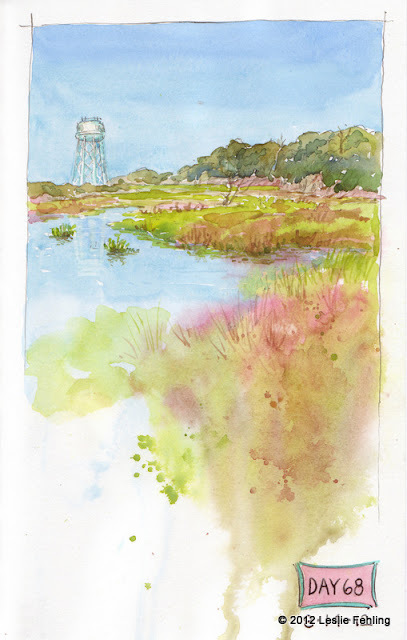 The brilliant yellow-green of the marsh grass glowed in the morning sunshine and a flock of egrets foraged for their breakfast off in the distance. 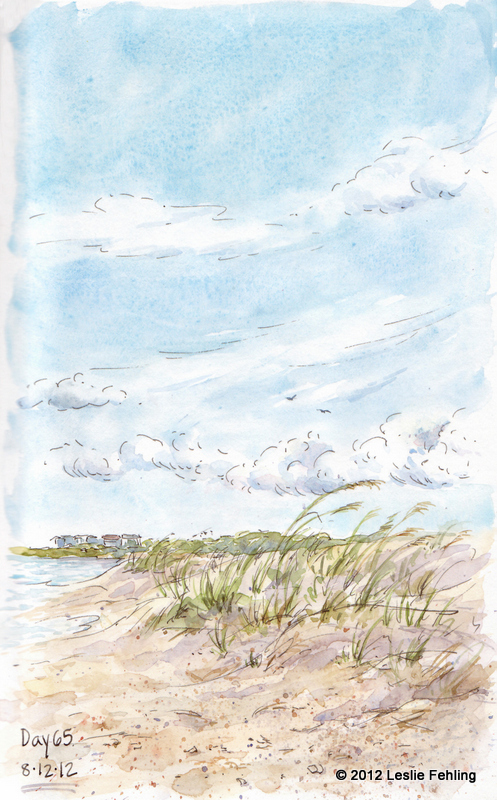 That big blue sky, uninterrupted by clouds, held the promise of another perfect day at the beach. ... my grandson playing in his inflatable pool on the deck, and granddaughter, Lilly, helping him make "soup" in a big stainless steel kettle. Kitchen utensils make the best toys! 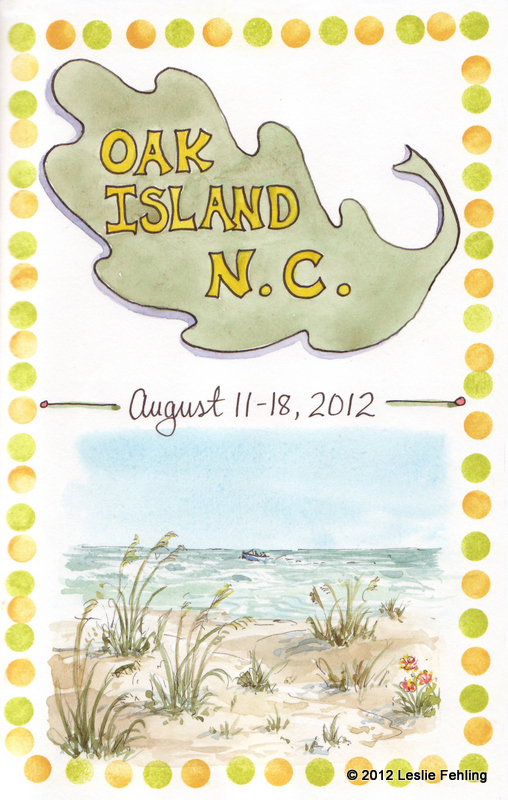 Oak Island, North Carolina, has been our beach vacation destination for the past ten years or so. 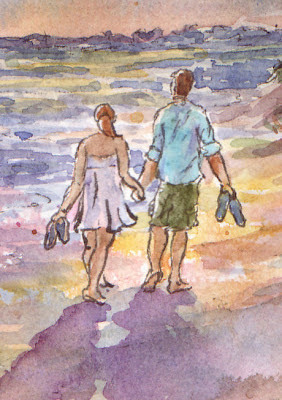 We love the beautiful beaches, warm, clean water, and laid-back family atmosphere. This year we rented a house at the far end of the island, with perfect sunset views and beaches that were almost deserted. Sitting under an umbrella with a good book, watching the waves roll in, is the best way I can think of to spend a day, and that's what I did all week long. 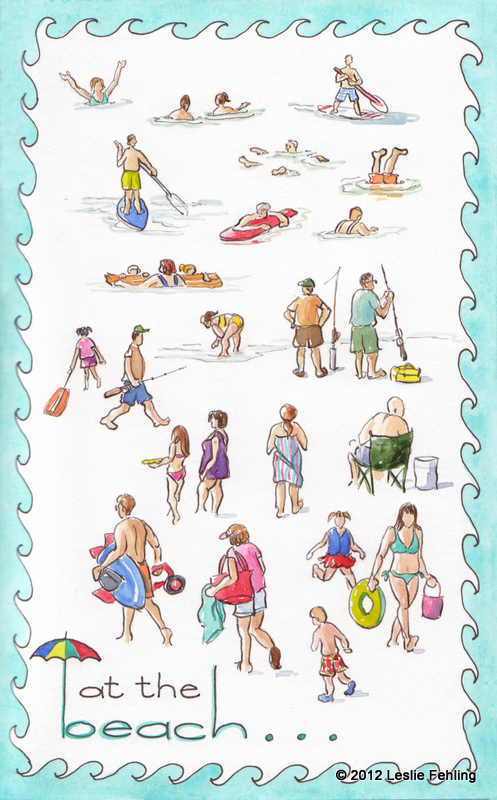 With sunny skies, temps in the mid 80s, and not a drop of rain, it was a perfect week at the beach. Watch for more sketches tomorrow! When we headed for the beach a few weeks ago, I was hoping I'd be able to keep up with my sketching while I was away, knowing it wasn't going to be easy with all the commotion of sharing a beach house with extended family. But I figured that, if I managed to sketch almost every day for the past two months, I should be able to fit it in when I'm on vacation, without the everyday demands of work and home. 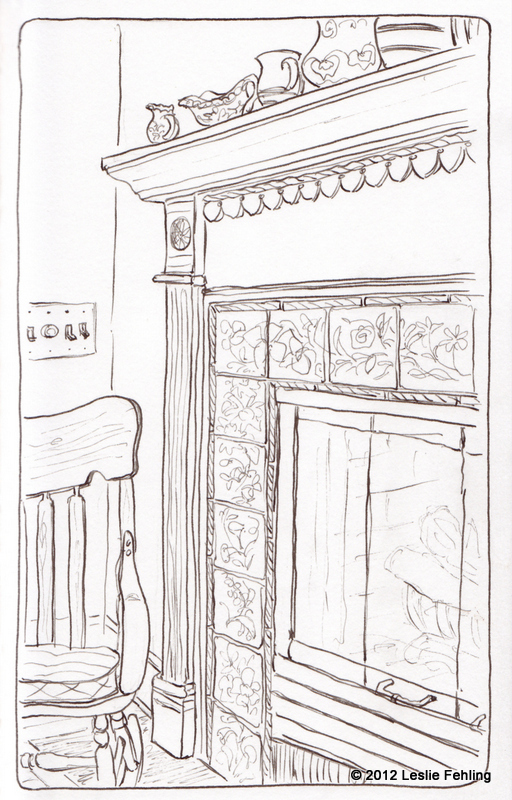 The double fireplace goes through to the living room on the other side and keeps things nice and cozy in the winter. Read more about the hand-painted tile here. 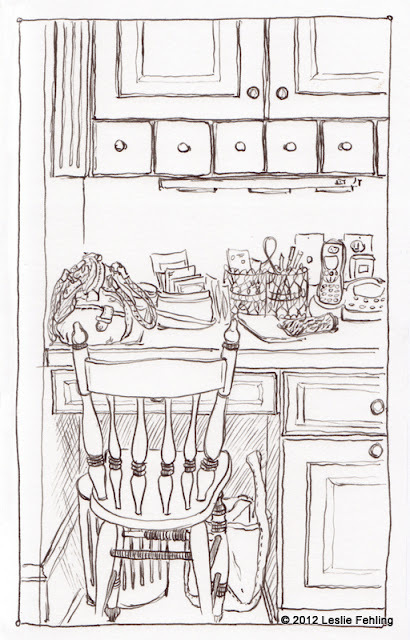 This is my favorite of this group of sketches ... my messy but functional desk area.